Hey lovelies! Can you believe it? Party Doll Manila is now 3 years old! The past few years have been very exciting for us here in PDM and we truly appreciate your continuous support. Thank you for sending all those heartwarming emails and private messages, we love reading them! You see, your insights are important to us and we want to know more about you. Let’s help one another and share tips, discoveries and ideas on how we can make our celebration more meaningful and beautiful. With this, we would like to introduce “Dear Party Doll Manila”. Do you want to be featured here in partydollmanila.com? Share your thoughts with us in the comment section of our monthly “Party Doll Manila wants to know” post in our Facebook fan page and Instagram account. You don’t need to write a 500-word essay for this, just 2 to 3 sentences will be perfect. Oh and don’t forget to use our official hashtag #DearPDM. We might choose your answer and share it together with your photo here in the blog! Got questions to ask? 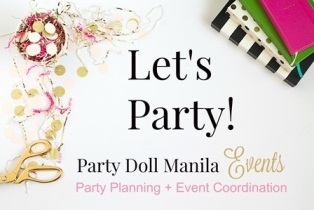 Send it to partydollmanila@gmail.com with the subject “Dear Party Doll Manila” and let’s get some answers from our fellow party planning moms and dads. Watch out for our first #DearPDM question on August 1, 2016! Ready?